If you have just gotten engaged, then part of your planning will certainly involve choosing a caterer to provide food for your special day. Knowing which Cleveland or Akron-based catering company to select can be a hand-wringing experience. Asking good questions is the first step to finding the right caterer for your event. When you begin researching the best caterer for your wedding reception, it is important to have a few key pieces of information to help you start the conversation with any caterer you choose to interview. Knowing the date of your wedding, the estimated budget you’d like to spend for food, the location of the reception and an estimated headcount for the event are all pieces of information that will help you to determine very quickly if a caterer will be a good fit for you. 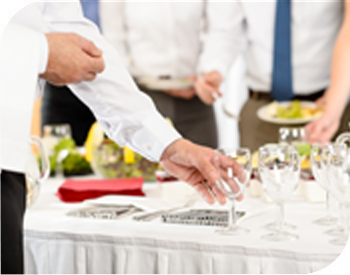 Once you have decided if the caterer in Cleveland is able to service your event, there are other considerations to take into account. If you have family members or friends who have special dietary needs, asking if the Akron caterer can provide vegetarian or vegan entrées may make your day delightful for those with specific food preferences. The use of local ingredients is another prime consideration. Local ingredients not only are more flavorful, but often cost less than out of season ingredients. Additionally, knowing if a caterer will offer a variety of different types of food service, including plated meals, buffets and family-style will give you and your fiancée options as you design your wedding reception. If you are from a family that has many ethnic traditions, then asking the catering service if they can accommodate family recipes, regional or ethnic cuisines may be an important aspect of the interviewing process. Knowing that they are willing to offer your aunt’s famous tamales may be the piece of information that you need to make a decision. In addition to the food itself, there are other considerations that will help you to determine if this is the right caterer for your event. Finding out if your caterer offers a rental service can help you to get the tents, chairs, and service pieces you need under one roof. Making sure they have the proper licensing protects you and your guests from issues with the food service. Lastly, you’ll need to find out how much of a deposit the caterer requires and read their service contract carefully. Next Next post: Clambake Season!